The Spring 2013 festival horse is called the Lissuin/Lussuin Horse. 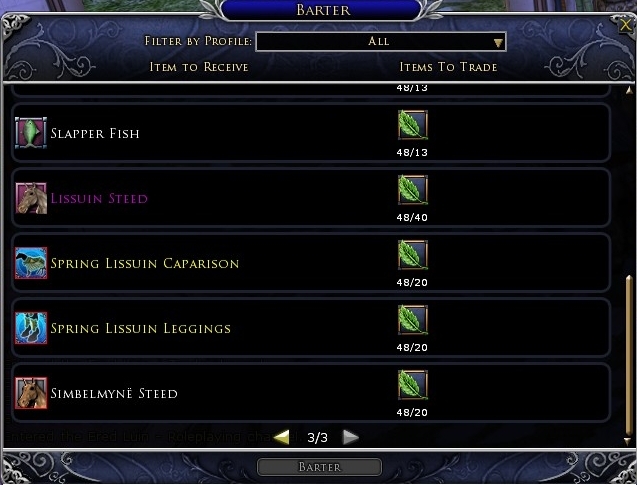 He can be bartered from the festival vendors for 40 Spring Leaves. I have to practice writing that one... L U S S U I N.
Also, the Lussuin has matching Warsteed Cosmetics; there are 4 pieces. The Lussuin Horse and the Warsteed Caparison and the Leggings are bartered at the Spring Rewards Vendor, which are in several places (I saw one near the elf dance area in Duillond, and another in the dwarf dance area in Thorin's Hall). The Horse costs 40 Spring leaves; the Caparison and the Leggings cost 20 leaves each. The Halter and the Saddle are bartered next to "the flower guy" (at Gredlan Mugwort) in the center of Bree. He will trade one piece of Warsteed Cosmetic for 80 of each flower (80 primroses, 80 marigolds, 80 violets). 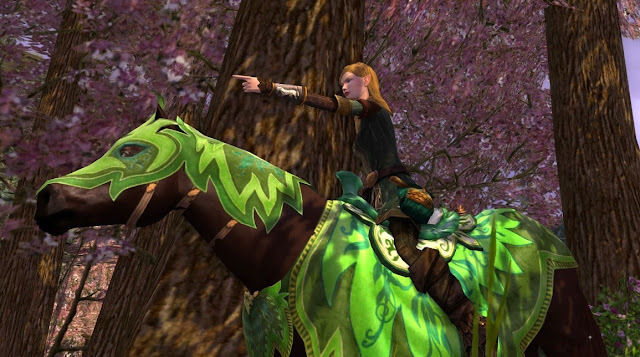 The flowers are super easy to get as they are gatherable west of Bree, north of Michel Delving, and west of Celondim. You have an hour to gather flowers for the daily quest which is plenty of time to gather 80+ of each. Fortunately, I had some leftover from last year and was able to get both Warsteed pieces at the same time. 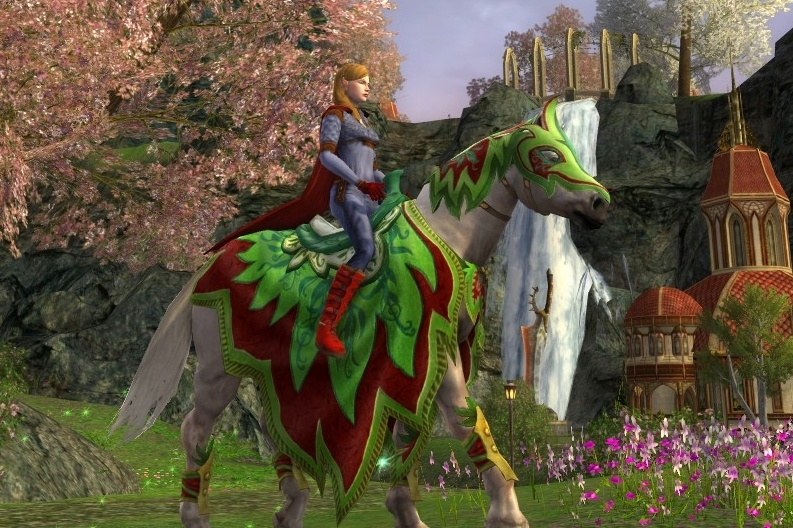 If you haven't gotten it yet and wanted it, the Steed of the Jester, last year's rare horse, is now barterable with 100 each flowers. 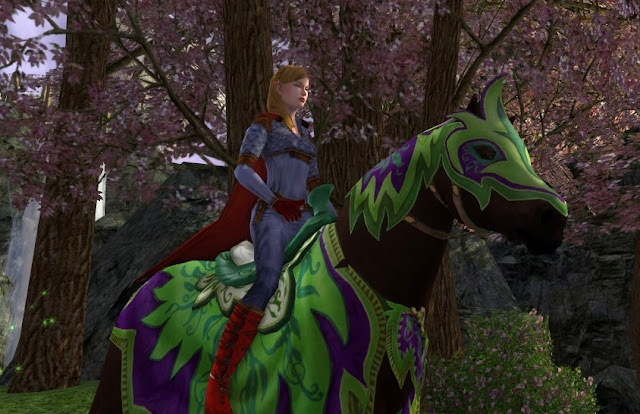 Here is an article from last year on the Steed of the Jester (Steed-of-Jester-and-others) and he and all other steeds in lotro can be found in the Gallery at All-Steeds. 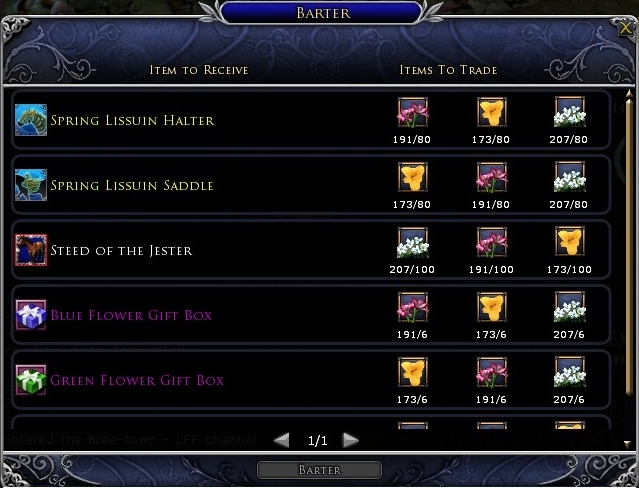 Good to know if you are a gambler... these Flower boxes contain lots of random junk, but also could contain the Steed of the Jester (like last year), or could contain a FULL set of Lussuin Warsteed Cosmetics. I loathe the random number generator (I'm sure the feeling is mutual hence my terrible /rolls, lol) so I just bartered everything straight out and am thankful for the option. Lussuin Horse: Here is the Lussuin horse. He is a light brown horse. The outfit is shades of green and white. I was initially unsure about the look, but it is subtly gorgeous. Lussuin Warsteed, default: Here is the Lussuin Warsteed, in its default hide and outfit colors. 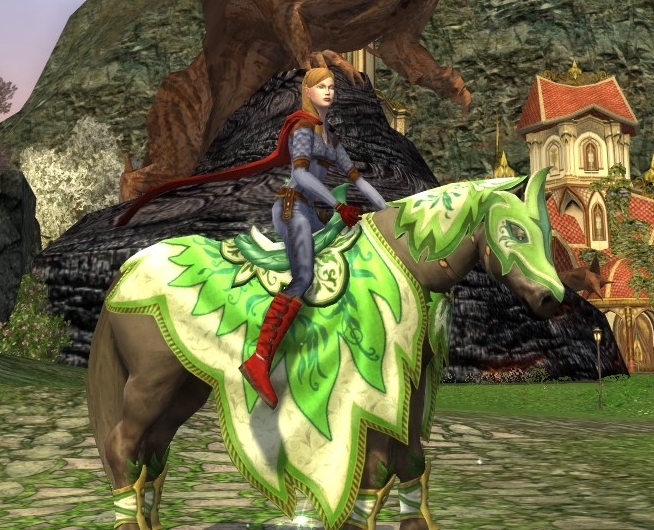 It looks identical to the Horse, except Warsteeds default to "Warsteed Grey". Lussuin Warsteed, white and crimson: Here is the Warsteed, white hide and crimson cosmetic dye. It either looks very Regal or like we are going to go to a strawberry festival. You won't get that out of your head now. hehe. I do like this one though. Lussuin Warsteed, charcoal and ered luin blue:Warsteed, charcoal hide and Ered Luin dye. It is still probably very elven looking. Lussuin Warsteed, black chestnut and purple: Warsteed, black chestnut hide and Purple dye. Oohh. 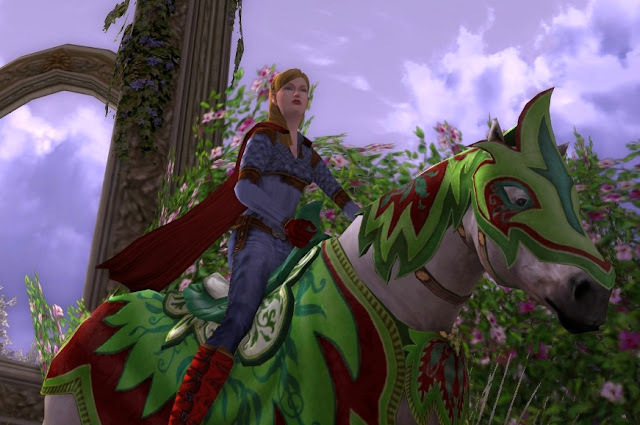 I could see the elven army riding in formation on this one (or enjoying a Mardi Gras parade). 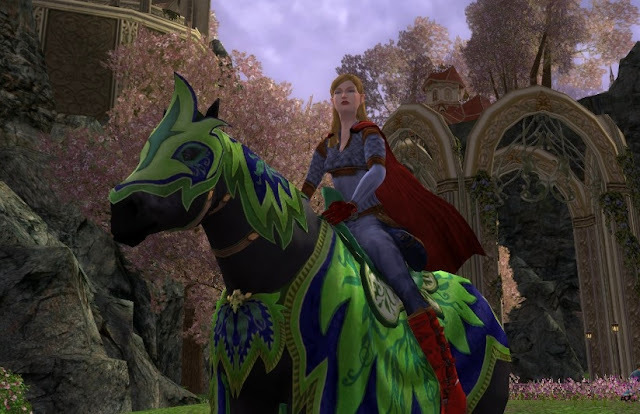 Lussuin Warsteed, black chestnut and olive: If you visit this site semi-regularly, you know I don't get out of Supergirl outfit often... it seems that I still have an outfit slotted from ages ago when I bought the Isengard expansion (this outfit is called Eorlingas for you cosmetic buffs). So, I decided to try to match it to show that this Warsteed really does look great with the right cosmetics. Here is the Warsteed, Black chestnut hide and Olive dye. I can totally see this steed cutting through the forest, a Tracker on his back hunting down orc prey. Warsteed outfit is first priority! That's why I came! Good to know it won't take me forever to collect the flowers needed, too. "Lussuin Warsteed, white and crimson: Here is the Warsteed, white hide and crimson cosmetic dye. It either looks very Regal or like we are going to go to a strawberry festival. You won't get that out of your head now. hehe. I do like this one though." It's called Lissuin. :) You were right that one needs practice to write this name. However, for cooks out there, there are three new recipes of note, for Supreme (can't recall the name), Westfold (Bilberry Tart), and Eastemnet (Cherry Tart) - all for 15 leaves IIRC. Parnassica... I am fairly confident (moreso than I am about how to spell "Lissuin") that the Warsteed cosmetic earned by characters that don't have Warsteeds are saved in their profile and show up when you do in fact get a warsteed. 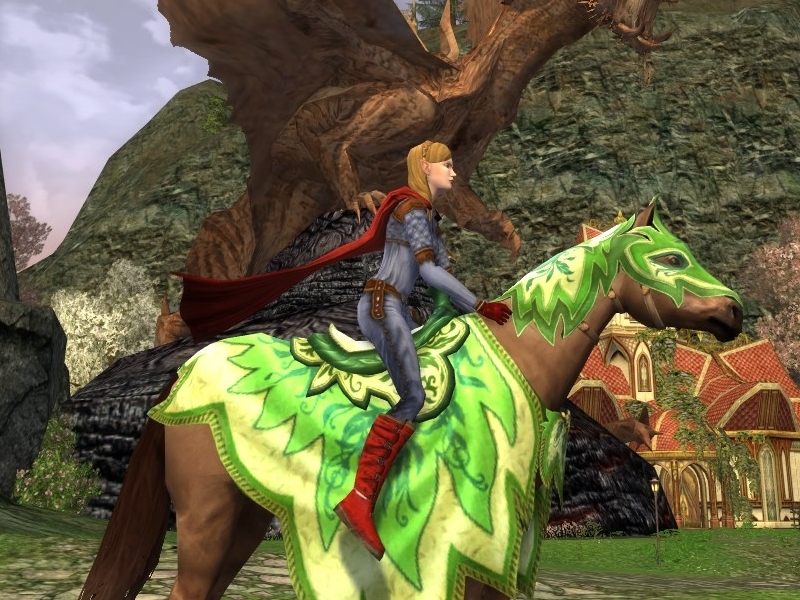 To that end, I definitely had a pile of warsteed cosmetics from previously earned steeds when Rohan was released. The lildanas are all around level 50 and I have seen them earn Warsteed cosmetics and am expecting those items to show up in the list when they unlock the Warsteeds. Absolutely love this steed. I've been wanting a leafy, elvish war-steed appearance for a long time. The purple dye looks like a Mardi Gras theme, lol. Anonymous ... I am so embarrassed. Do you have any idea how many times I looked at that name and STILL got it wrong!? I even paused to spell it out letter by letter because it was such a foreign word to me. At least for the moment, I have opted to leave the screwups as they are... at this point, I think Turbine should just change his name to match how I spelled it. lol! TheElvenTailor ... Yay! One thing I like about the warsteed is how nicely it dyes. Lately, I've had a string of warsteeds that barely dye at all. Ravanel .... I was saying nearly the exact same thing about love-it-or-hate-it to a friend yesterday! An alternative to toning the brightness down would be to "work it" and go dazzling. Where do you get the quest to gather flowers? There is a person right west of the boar fountain in Bree that has the quest - and the person that has the barter items right is next to him. Excellent Mini-nonymous! I'm so glad you like the site! Your gathering of warsteed cosmetics for alts and love of the horse has inspired me to get in gear and let the lildanas more fully enjoy the festival! Yay to you! Yes sorry, I could only post as anonymous. 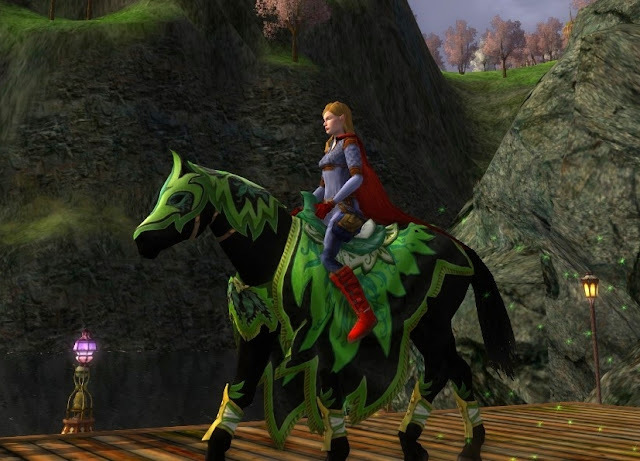 Our elven rune-keeper, Wrynne, earned her new festival horse and a lovely hat too. Lilly, Digger's wife, got the full set of warsteed tack and loves it. She even made a full outfit of green to match. She looks so fierce racing around old Buggy. Now Wrynne is envious and may try to earn the tack even though she is only 73 and learning still. Thanks for your great posts and valuable guides.